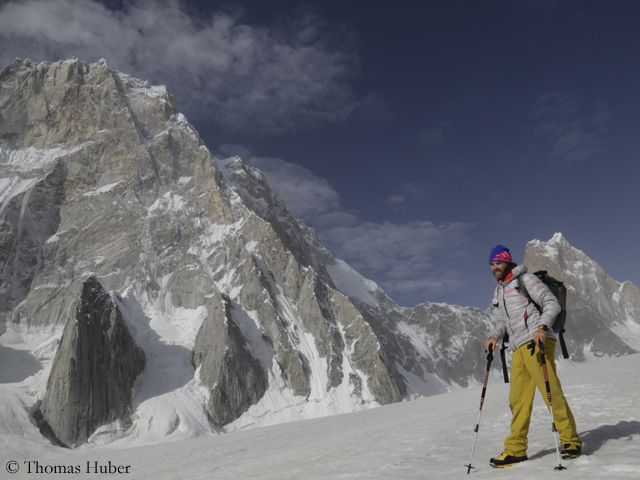 Thomas Huber‘s new Karakoram adventure began with a rescue mission. The German top climber’s exact local knowledge on the Ogre (also called Baintha Brakk) was in demand. 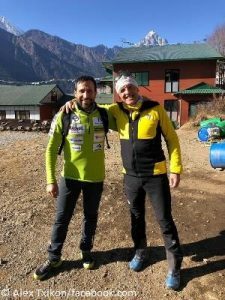 About a week ago (I report on it only now because I was on holiday in the Alps at that time) the 49-year-old was picked up by a Pakistani rescue helicopter to search along with the crew for the missing Kyle Dempster and Scott Adamson. In vain. No sign of the Americans. In the end the search was canceled because there was no more hope of finding them alive. 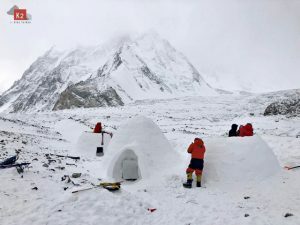 The Pakistani expedition cook of the two Americans had seem them from Base Camp for the last time on August 22: About halfway up the still unclimbed North Face of the 6960-meter- high Ogre II. Then the weather changed, storm and heavy snowfall began. When there was still no sign of life from Dempster and Adamson even after days, families and friends of both started a crowd funding on the Internet to finance the helicopter rescue. 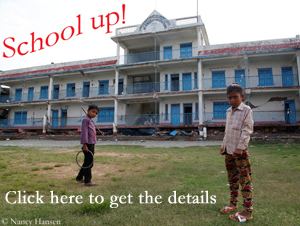 Within days, they collected the required sum of nearly $ 200,000. Kyle and Scott had tackled the North Face already in 2015, then Adamson had broken his leg just below the summit ridge. With luck, both had survived the descent. 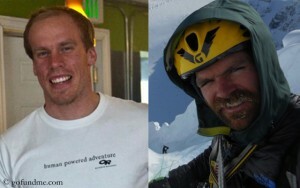 Dempster and Adamson were well-known members of the international top climbing scene. 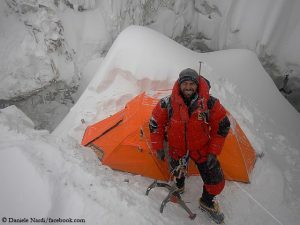 The 34-year-old Adamson had succeded some first ascents in Nepal and Alaska. 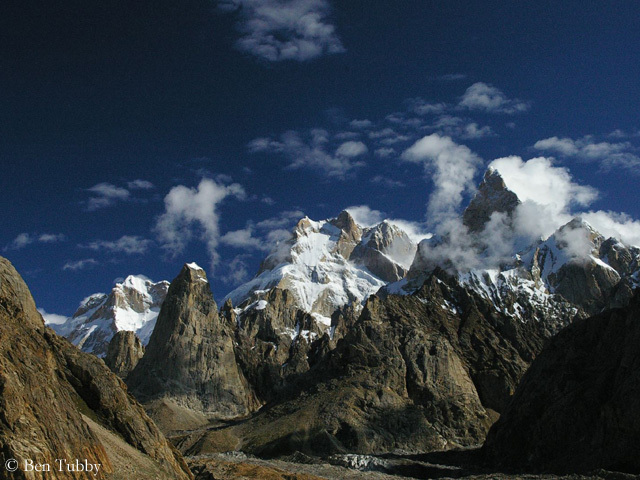 The 33-year-old Dempster loved the Karakoram, a “pretty mind blowing place”, as he once said. Kyle had been awarded twice the Piolet d’Or, the “Oscar for mountaineers“: in 2010 (along with Bruce Normand and Jed Brown) for the first ascent of the North Face of the 6422-meter-high Xuelian West in China – and then in 2013 (along with Hayden Kennedy and Josh Wharton) for a new route on the southeast side of the Ogre I. 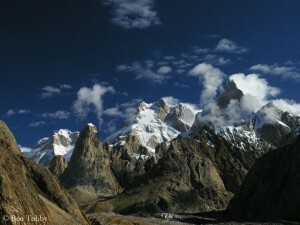 In the previous year the trio had succeeded the only third ascent of the 7285-meter-high granite giant in Karakorum. The legendary first ascent of Ogre had been done by the British Doug Scott and Chris Bonington in 1977. Then it took 24 years until Thomas Huber along with the Swiss Iwan Wolf and Urs Stoecker reached the summit for the second time. Almost three weeks earlier they had already succeeded the first ascent of the 6,800-meter-high Ogre III. So Thomas Huber is familiar with this mountain massif. But even with his support the search for Dempster and Adamson remained unsuccessful. This fall, Thomas and his German climbing partners Toni Gutsch and Sebastian Brutscher are tackling the north side of the 7145-meter-high Latok I which is located not far from the Ogre. Neither the North Face nor the North Ridge have so far been climbed up to the highest point. “I have also the courage to say no at any moment,” the older of the Huber brothers told me before his departure to Pakistan. “If I feel that it doesn’t work physically, I’ll say no.” Thomas had survived a 16-meter fall from a rock face in the Berchtesgaden region on July 5 – “with incredible luck,” as he himself acknowledged. The two US climbers on the Ogre sadly were not favored by such a fortune.